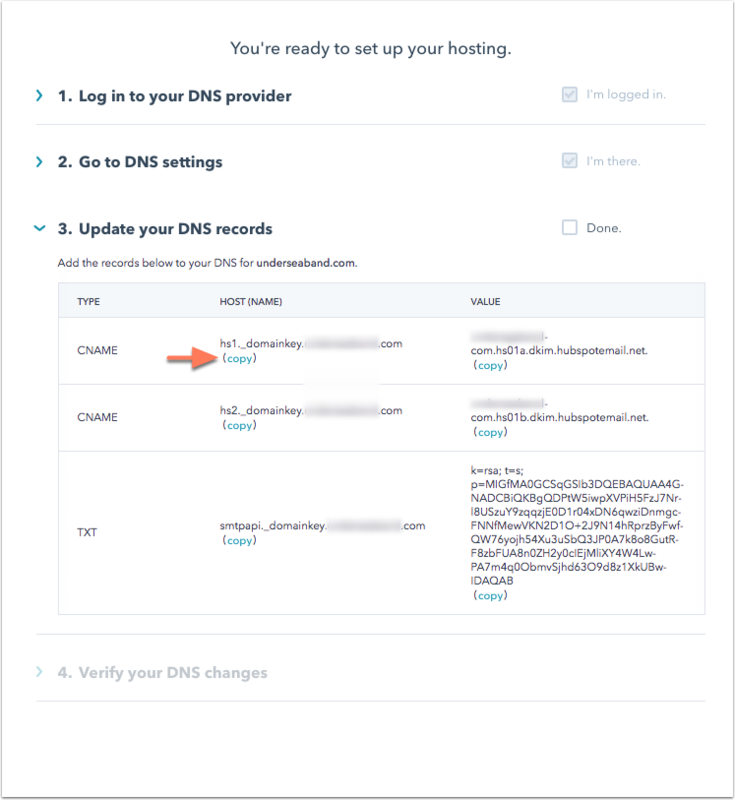 To fully connect your email sending domain in HubSpot, it is now required to add one TXT record and two CNAME records in your Domain Name Server (DNS). These additional DNS records provide increased security and reliability for email sending. By connecting the additional CNAME records, it allows your emails to be sent over multiple sending systems. If there was ever a problem with one system, the tool could automatically route your mail over another system without negatively impacting your mail stream. Domains that have been connected in HubSpot with one TXT record but have not yet been updated with the additional two CNAME records will be partially connected in a state of Connected (missing records). Follow the instructions below to finish connecting your email sending domain in HubSpot. Please note: effective January 31, 2019, all HubSpot users will be required to connect one TXT record and two CNAME records in order to remove the 'via HubSpot' branding that appears at the top in your marketing emails. Scroll down to the Email Sending Domains section. If a domain is Connected (Missing records), click Missing records, then click Update records to finish connecting this domain. If your email sending domain is hosted on GoDaddy, you can connect the additional records by clicking Authorize with GoDaddy. You'll be prompted to enter your username and password to log into your GoDaddy account in a new browser. 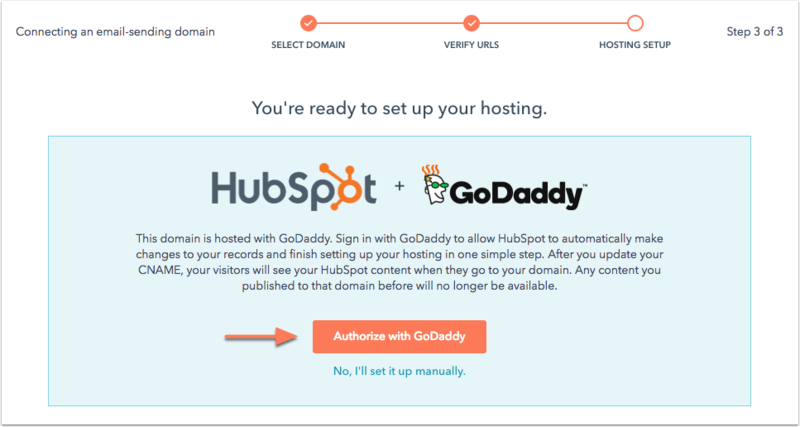 After you log in, GoDaddy will add the new CNAME records from HubSpot automatically. If your email sending domain is not hosted on GoDaddy, you can connect the two additional CNAME records manually in a few steps. Log into your DNS provider, then click I'm logged in. Navigate to your DNS settings, then click I'm there. In your DNS provider account, add a new CNAME record type for your domain. Click copy next to the Host (name) to place this content on your clipboard, then paste the host name into the corresponding field in your DNS provider account. Click Copy next to the Value column, then paste it into the corresponding field in your DNS provider account. Complete these steps for both CNAME records, then Save your changes in your DNS provider account. Click Done in your domain manager in HubSpot. 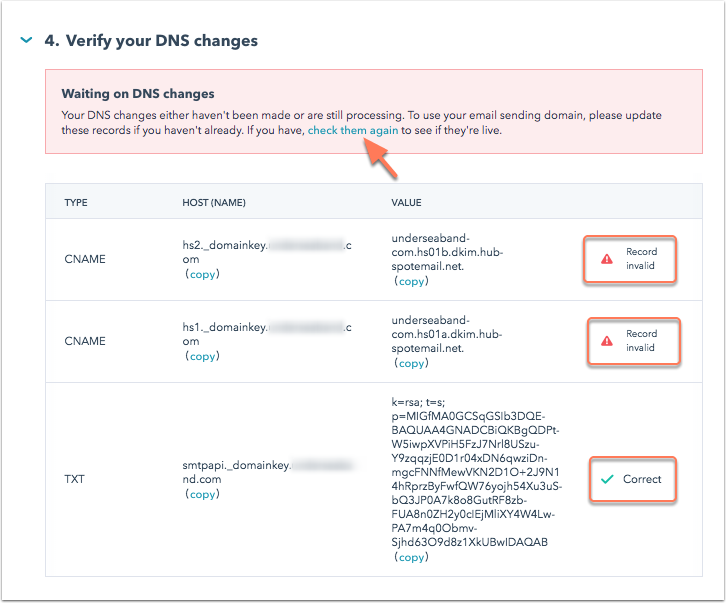 After your new records have been added, you can verify your DNS changes. Records that have propagated will be marked as Correct in your domain manager. Please note: depending on your DNS provider, it may take 1-12 hours for the DNS changes to propagate. You can click check them again to refresh the status in your domain manager.